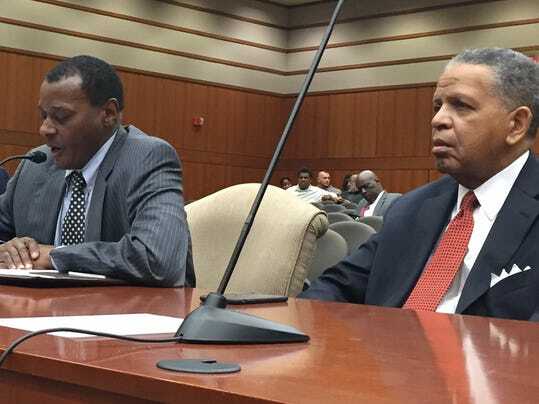 BATON ROUGE – The Grambling Search Committee of the University of Louisiana Board of Supervisors heard impassioned pleas from Grambling alumni and advice from the Hollins Group Inc. on Tuesday about the time line for the appointment of the university’s new president. While alumni and current students urged the committee to abide by the current time line, ULS President Sandra Woodley and the board adopted some flexibility that would allow candidates to have more information about the university’s financial position before their names would be announced publicly. Although the announcement of the semifinalists was scheduled originally for Tuesday, Lawrence Hollins of the Hollins Group recommended the committee wait for more information on the financial situation of the university. The search firm told the committee that there are 37 completed applications for the position, calling the pool “exceptional” given the skepticism over the budget issues. Woodley said that even with delaying the announcement of the names, it is possible that the search will conclude at the same time as the original time line, but it depends on what happens in the upcoming session of the Legislature. “It’s possible that at some point in April there may be a budget bill with enough information that we can give some level of comfort for applicants to remain in the pool and have their names released,” Woodley said. “You don’t want an individual to come into your place because it’s nice and calm and they’re no struggles,” Grambling alumnus William Hughey said. Search committee member Edward Crawford noted that the applicants’ concerns over finances were not unique to Grambling. The committee hopes to announce the names of the candidates in May and have on campus interviews in June. They would like the new president to start as soon as possible. “It is everyone’s goal to select the president as soon as possible, but that can’t come with the risk of not having the best choices,” committee chair Gerald Hebert said. Follow Barbara Leader on Twitter @barbaraleader1.